I am not a lover of Sundried Tomatoes but as they say, there is always an exception to every rule. In fact they make my hair stand on end! 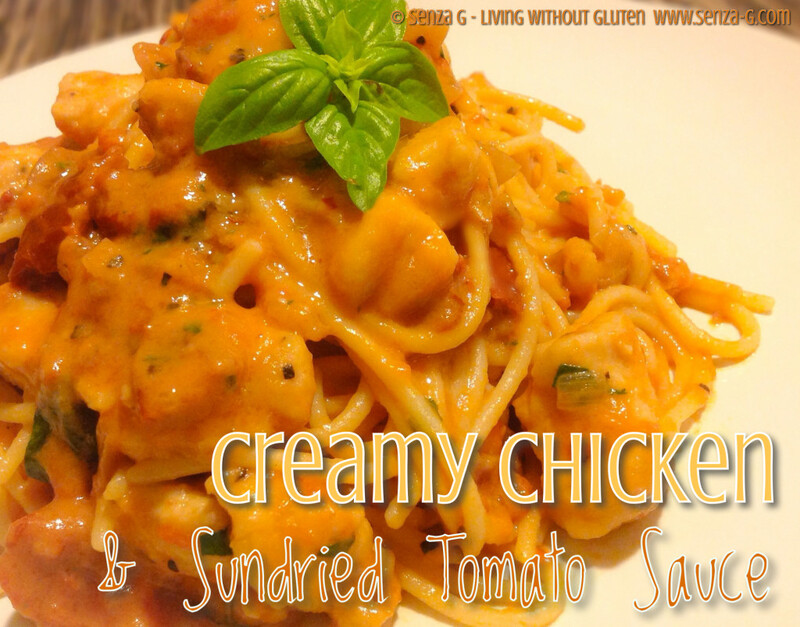 But the sundried tomatoes in this sauce give it that distinctive taste. And they marry really well with the fresh basil! Before saying no, give it a try! Start by chopping the chicken breast into cubes. Put the cubes in a plastic bag with a level tablespoon of cornflour seasoned with salt and pepper. Shake until all the chicken pieces are covered. Heat some olive oil in a pan and sauté the chicken cubes with two cloves minced garlic. Remove from pan and set aside. Saute onion & remaining garlic in the saucepan. When onions are soft, add some wine and stir till it reduces slightly. Then add the tomatoes, the tomato puree, the sugar, bay leaf and about a third cup water. Bring to the boil and then lower the heat, adding the sun dried tomatoes. Add salt & pepper, chilli if using. Simmer 20-30 minutes or until sauce reduces. Boil your gluten free pasta and whilst the pasta is cooking, add the cooked chicken to the sauce, then add the cream and the chopped basil and parsley. Combine. When pasta is ready, drain and add to the sauce. Mix well but gently as Gluten Free Pasta breaks easily. Serve garnished with Basil leaves and grated Parmesan Cheese on the side.